This article is about the long fish. For other uses, see Eel (disambiguation). "Eels" redirects here. For the band, see Eels (band). 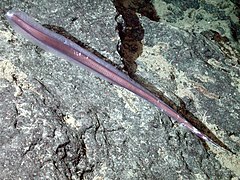 The European conger is the heaviest of all eels. 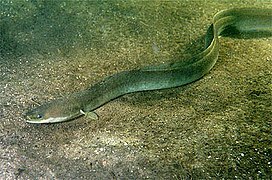 The heaviest true eel is the European conger. The maximum size of this species has been reported as reaching a length of 3 m (10 ft) and a weight of 110 kg (240 lb). Other eels are longer, but do not weigh as much, such as the slender giant moray which reaches 4 m (13 ft). Eels begin life as flat and transparent larvae, called leptocephali. 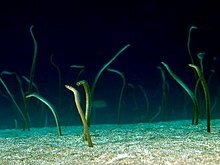 Eel larvae drift in the surface waters of the sea, feeding on marine snow, small particles that float in the water. Eel larvae then metamorphose into glass eels and then become elvers before finally seeking out their juvenile and adult habitats. Many eels remain in the sea throughout their lives, but freshwater elvers of eels in the family Anguillidae travel upstream and are forced to climb up obstructions, such as weirs, dam walls, and natural waterfalls. Lady Colin Campbell found, at Ballisodare, the eel fisheries were greatly improved by the hanging of loosely plaited grass ladders over barriers, enabling the elvers to ascend. This classification follows FishBase in dividing the eels into 20 families. Additional families included in other classifications (notably ITIS and Systema Naturae 2000) are noted below the family with which they are synonymized in the Fish Base system. 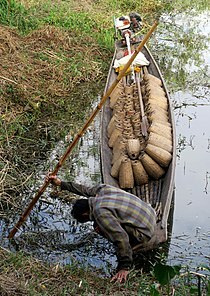 Identifying the origin of the freshwater species has been problematic. Genomic studies indicate they are a monophyletic group which originated among the deep-sea eels. Taxonomy based on Neslon, Grande and Wilson 2016. 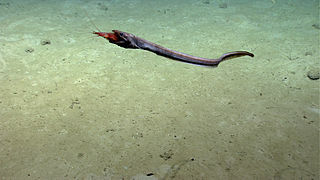 In some classifications, the family Cyematidae of bobtail snipe eels is included in the Anguilliformes, but in the FishBase system that family is included in the order Saccopharyngiformes. The electric eel of South America is not a true eel, but is a South American knifefish more closely related to the carps and catfishes. Phylogeny based on Johnson et al. 2012. Freshwater eels (unagi) and marine eels (conger eel, anago) are commonly used in Japanese cuisine; foods such as unadon and unajū are popular, but expensive. Eels are also very popular in Chinese cuisine, and are prepared in many different ways. Hong Kong eel prices have often reached 1000 HKD (128.86 US Dollars) per kg, and once exceeded 5000 HKD per kg. The European eel and other freshwater eels are eaten in Europe, the United States, and other places. A traditional east London food is jellied eels, although the demand has significantly declined since World War II. The Spanish cuisine delicacy angulas consists of elver (young eels) sautéed in olive oil with garlic; elvers usually reach prices of up to 1000 euro per kg. New Zealand longfin eel is a traditional Māori food in New Zealand. In Italian cuisine, eels from the Valli di Comacchio, a swampy zone along the Adriatic coast, are especially prized, along with freshwater eels of Bolsena Lake and pond eels from Cabras, Sardinia. 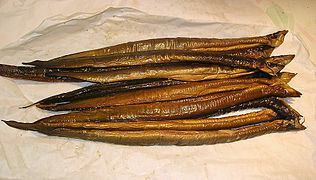 In northern Germany, the Netherlands, the Czech Republic, Poland, Denmark, and Sweden, smoked eel is considered a delicacy. 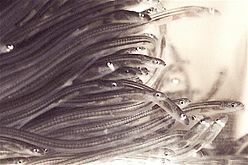 Elvers, often fried, used to be a cheap dish in the United Kingdom; but, during the 1990s, their numbers collapsed across Europe. They are now not just a delicacy, but the UK's most expensive species. 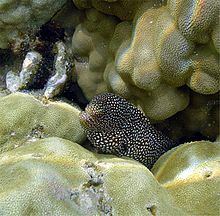 Eels, particularly the moray eel, are popular among marine aquarists. 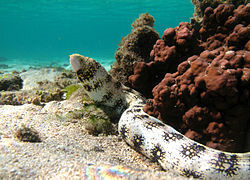 Eel blood is toxic to humans and other mammals, but both cooking and the digestive process destroy the toxic protein. The toxin derived from eel blood serum was used by Charles Robert Richet in his Nobel Prize-winning research which discovered anaphylaxis (by injecting it into dogs and observing the effect). The poison used by Richet was actually obtained from sea anemones. Eelskin leather is highly prized. It is very smooth and exceptionally strong. However, it does not come from eels. 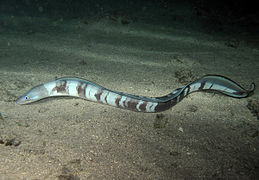 It comes from the Pacific hagfish, a jawless fish which is also known as the slime eel. The large lake of Almere, which existed in the early Medieval Netherlands, got its names from the eels which lived in its water (the Dutch word for eel is aal or ael, so: "ael mere" = "eel lake"). The name is preserved in the new city of Almere in Flevoland, given in 1984 in memory of this body of water on whose site the town is located. The daylight passage in the spring of Elvers upstream along the Thames was at one time called "eel fare". The word 'elver' is thought to be a corruption of "eel fare." A famous attraction on the French Polynesian island of Huahine (part of the Society Islands) is the bridge across a stream hosting 3- to 6-ft-long eels, deemed sacred by local culture. Eel fishing in Nazi-time Danzig plays an important role in Günter Grass' novel The Tin Drum. The cruelty of humans to eels is used as a metaphor for Nazi atrocities, and the sight of eels being killed by a fisherman triggers the madness of the protagonist's mother. 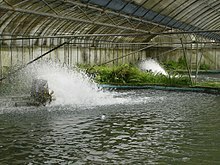 Sinister implications of eels fishing are also referenced in Jo Nesbø's The Cockroaches, the second book of the Harry Hole detective series. The book's background includes a Norwegian village where eels in the nearby sea are rumored to feed on the corpses of drowned humans – making the eating of these eels verge on cannibalism. In 2010, Greenpeace International has added the European eel, Japanese eel, and American eel to its seafood red list. Japan consumes more than 70% of the global eel catch. The English name "eel" descends from Old English ǣl, Common Germanic *ēlaz. Also from the common Germanic are West Frisian iel, Dutch aal, German Aal, and Icelandic áll. Katz (1998) identifies a number of Indo-European cognates, among them the second part of the Latin word for eels, anguilla, attested in its simplex form illa (in a glossary only), and the Greek word for "eel", egkhelys (the second part of which is attested in Hesychius as elyes). The first compound member, anguis ("snake"), is cognate to other Indo-European words for "snake" (compare Old Irish escung "eel", Old High German unc "snake", Lithuanian angìs, Greek ophis, okhis, Vedic Sanskrit áhi, Avestan aži, Armenian auj, iž, Old Church Slavonic *ǫžь, all from Proto-Indo-European *oguhis, ēguhis).The word also appears in the Old English word for "hedgehog," which is igil (meaning "snake eater"), and perhaps in the egi- of Old High German egidehsa "wall lizard". According to this theory, the name Bellerophon (Βελλεροφόντης, attested in a variant Ἐλλεροφόντης in Eustathius of Thessalonica), is also related, translating to "the slayer of the serpent" (ahihán). On this theory, the ελλερο- is an adjective form of an older word, ελλυ, meaning "snake", which is directly comparable to Hittite ellu-essar- "snake pit". This myth likely came to Greece via Anatolia. In the Hittite version of the myth, the dragon is called Illuyanka: the illuy- part is cognate to the word illa, and the -anka part is cognate to angu, a word for "snake". 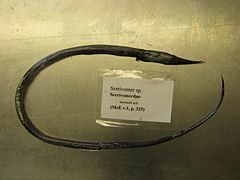 Since the words for "snake" (and similarly shaped animals) are often subject to taboo in many Indo-European (and non-Indo-European) languages, no unambiguous Proto-Indo-European form of the word for eel can be reconstructed. It may have been *ēl(l)-u-, *ēl(l)-o-, or something similar. ^ a b Froese, Rainer, and Daniel Pauly, eds. (2009). "Anguilliformes" in FishBase. January 2009 version. ^ a b McCosker, John F. (1998). Paxton, J.R.; Eschmeyer, W.N. (eds.). Encyclopedia of Fishes. San Diego: Academic Press. pp. 86–90. ISBN 0-12-547665-5. ^ Long Jr, J. H., Shepherd, W., & Root, R. G. (1997). Manueuverability and reversible propulsion: How eel-like fish swim forward and backward using travelling body waves". In: Proc. Special Session on Bio-Engineering Research Related to Autonomous Underwater Vehicles, 10th Int. Symp. (pp. 118–134). ^ Prosek, James (2010). Eels: An Exploration. New York: HarperCollins. ISBN 978-0-06-056611-1. ^ FishBase Archived 10 November 2013 at the Wayback Machine. 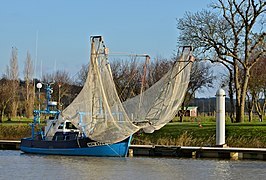 FishBase (2011-11-15). ^ a b Campbell, Lady Colin (1886). A Book of the Running Brook: and of Still Waters. New York: O. Judd Co. pp. 9, 18. ^ Inoue, Jun G.; et al. (2010). "Deep-ocean origin of the freshwater eels". Biol. Lett. 6 (3): 363–366. doi:10.1098/rsbl.2009.0989. PMC 2880065. PMID 20053660. ^ Johnson, G. D.; Ida H.; Sakaue J.; Sado T.; Asahida T.; Miya M. (2012). "A 'living fossil' eel (Anguilliformes: Protanguillidae, fam nov) from an undersea cave in Palau". Proceedings of the Royal Society. (in press). doi:10.1098/rspb.2011.1289. PMC 3259923. ^ Froese, Rainer and Pauly, Daniel, eds. (2012). "Anguilla rostrata" in FishBase. May 2012 version. ^ "Anguilla rostrata". Integrated Taxonomic Information System. Retrieved 20 May 2015. ^ Froese, Rainer and Pauly, Daniel, eds. (2012). "Anguilla anguilla" in FishBase. May 2012 version. ^ Anguilla anguilla (Linnaeus, 1758) FAO, Species Fact Sheet. Retrieved 20 May 2012. ^ "Anguilla anguilla". Integrated Taxonomic Information System. Retrieved 20 May 2012. ^ Froese, Rainer and Pauly, Daniel, eds. (2012). "Anguilla japonica" in FishBase. May 2012 version. ^ Anguilla japonica, Temminck & Schlegel, 1846 FAO, Species Fact Sheet. Retrieved May 2012. ^ "Anguilla japonica". Integrated Taxonomic Information System. Retrieved 20 May 2012. ^ Jacoby, D. & Gollock, M. (2014). "Anguilla japonica". The IUCN Red List of Threatened Species. IUCN. 2014: e.T166184A1117791. doi:10.2305/IUCN.UK.2014-1.RLTS.T166184A1117791.en. Retrieved 4 January 2018. ^ Froese, Rainer and Pauly, Daniel, eds. (2012). "Anguilla australis" in FishBase. May 2012 version. ^ "Anguilla australis". Integrated Taxonomic Information System. Retrieved 20 May 2012. ^ Champken, Neil (2 June 2006). "Would you pay £600 for a handful of baby eels?". theguardian.com. Retrieved 7 April 2015. ^ Leake, Jonathan (7 February 2015). "EU's eel edict costs UK £100m". The Sunday Times. Retrieved 7 April 2015. ^ "Poison in the Blood of the Eel" (PDF). 9 April 1899. Retrieved 22 January 2010. ^ "The plight of the eel (mentions that "Only 0.1 ml/kg is enough to kill small mammals, such as a rabbit..." BBC online. Retrieved 22 January 2010. ^ "Hemolytic and toxic properties of certain serums." Wm. J. Keffer, Albert E. Welsh. Mendel Bulletin (1936), 8 76–80. ^ "Charles Robert Richet". encyclopedia.com. ^ snopes (4 December 2015). "Eelskin Demagnitizes : snopes.com". Snopes. Retrieved 21 April 2010. ^ "Greenpeace Seafood Red list". Greenpeace International. ^ "Indonesia eel hot item for smugglers". The Japan Times. Retrieved 30 July 2013. ^ Katz, J. (1998). "How to be a Dragon in Indo-European: Hittite illuyankas and its Linguistic and Cultural Congeners in Latin, Greek, and Germanic". In Jasanoff; Melchert; Oliver (eds.). Mír Curad. Studies in Honor of Calvert Watkins. Innsbruck. pp. 317–334. ISBN 3-85124-667-5. Tesch FW and White RJ (2008) The Eel John Wiley & Sons. ISBN 9781405173438. Wikimedia Commons has media related to Anguilliformes. Froese, Rainer, and Daniel Pauly, eds. (2006). "Anguilliformes" in FishBase. January 2006 version. "Apodes" . New International Encyclopedia. 1905. This page was last edited on 12 April 2019, at 14:43 (UTC).